Animated: No; Low-poly: Yes; Materials: Yes; Rigged: No; Textured: Yes; UV Layout: No; 3D File Formats Included: .3ds (multi format), .blend (blender), .fbx (multi format), .obj (multi format); Created In: blender; Geometry: Polygons; Poly Count: 7420. Low poly postapo racing car collection. Pack include Ford Falcon XB, Mercedes W114, Dodge Monaco, Buggy, Pontiac GTO. Textures and bump textures included. postapo Pontiac GTO (1965), LOW POLY; postapo Mercedes Benz W114 (1968), LOW POLY; postapo Buggy 01; postapo Dodge Monaco - police (1974), LOW POLY; postapo Ford Falcon XB (1973), LOW POLY; Mack Pinnacle 2011; LOW POLY VOLKSWAGEN CONSTELLATION MIXER 2011. 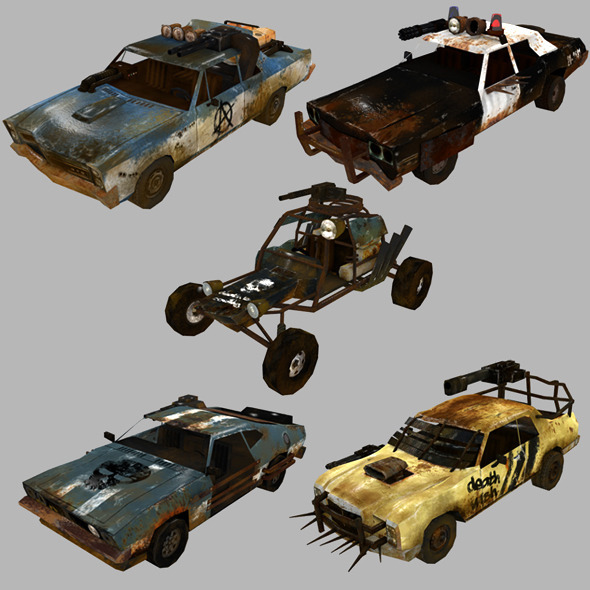 Keywords: apocalypse, armed, blender, car, collection, dodge, ford, game, GTO, low, low poly, lowpoly, mad max, mercedes, offroad, pack, painted, Pontiac, postapo, postapocalyptic, race, race car, racing, ready, rust, smuczko, textured, weapon. Best stock graphics, design templates, vectors, PhotoShop templates, textures & 3D models from creative professional designers. Create 3DOcean low poly postapo car set 01 11390450 style with PhotoShop, Illustrator, InDesign, 3DS Max, Maya or Cinema 4D. Full details of 3DOcean low poly postapo car set 01 11390450 for digital design and education. 3DOcean low poly postapo car set 01 11390450 desigen style information or anything related.